Trishaw Uncle pays tribute to all trishaw riders, for providing transport services rain or shine, from the time before cars, buses and trains. Hop in a trishaw expedition through the colourful, quaint and bustling streets of Singapore and experience the nostalgic memories and dynamic aspirations of the country. The Bugis and Little India Tour, which lasts about 30 minutes, takes you through Litlle India and Kampong Glam. It costs S$39/29 (Adult/Child). The Bugis, Little India and Singapore River Tour, which lasts about 45 minutes, takes you through Litlle India, Kampong Glam and along Singapore River. It costs S$49/39 (Adult/Child). 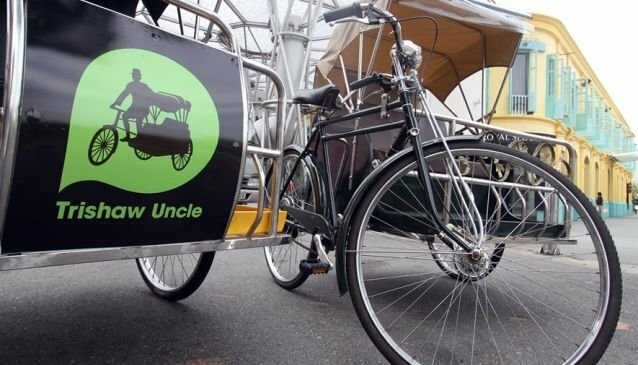 Food Trails From S$45 to S$63 per pax and based on twin-sharing basis for trishaws are also available as well as customised tours for VIPs, media, corporations, schools, grassroot organizations and more. All tours start from The Albert Mall Trishaw Park.